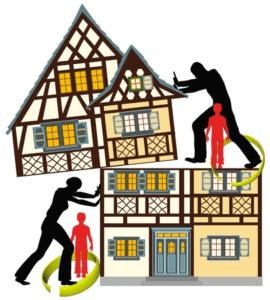 Co-owning Property With Your Former Spouse… After Divorce What Can Go Wrong? Q. Do we have to sell our property if we get a divorce? A. Parties to a divorce can contract the disposition of their property any way that they agree. If they are unable to agree, a court may order the property sold but it is definitely in the parties best interest to come up with a creative solution. It is important that the terms of the agreement be carefully spelled out in a Property Settlement Agreement (PSA), sometimes called a Marital Settlement Agreement (MSA). Q. What should the PSA include? 1) Who lives in the property, most likely giving exclusive possession. 2) Who is going to pay the mortgage, taxes and insurance? Generally I suggest that the person in possession has the status of a tenant and should be responsible for general upkeep, landscape, cleaning and maintenance. The joint owners must make some plans for major repairs and large, unexpected costs. Often parties will maintain a joint account to cover costs of the property. How will the couple hold title? Be sure and consider the implications of joint title with right of survivorship or tenants in common, there is a significant difference. 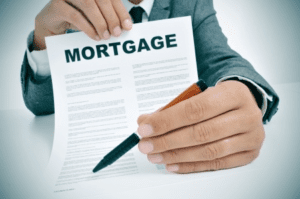 Who gets the mortgage interest rate deduction? Are there other tax implications? Often the couple will agree to carry life insurance to cover costs of the property in case of the death of one of them. Very important, is there an end date? Will the property be sold in five years? How will the proceeds be divided? A common way to address this is to have an agreement that provides within a certain time, one of the parties, usually the one in possession, will refinance the property and buy the other out. The parties can get very creative at this point but must be sure that they both are clear as to the provisions of their agreement. Q. What about commercial property, such as an apartment house? A. The PSA can also address a commercial property but in addition I generally suggest the couple work with a real estate attorney to develop an operating agreement. The parties may want to formalize their ownership as an entity such as a limited partnership or LLC. The agreement should cover the responsibilities of the parties…who collects the rent, who manages the property and makes or contracts for repairs, the tax implications and how the proceeds will be divided. Above all, do not leave this to a verbal agreement. It would also be a good idea to talk to a tax preparer regarding the tax consequences. Q. How do we divide Timeshare property? A. Timeshares create unique problems for property settlement. Often the parties paid a significant amount but cannot find a market for selling. It is very difficult to place a value on a timeshare for that reason. Also, most timeshares have a maintenance charge and that must be addressed. Again, the parties can make an agreement they think is fair. Sometimes one party takes the timeshare along with the financial obligation. Generally, if this is the option, it is placed at zero value in the spreadsheet. Some couples are able to share the use of the timeshare but this does require ongoing interaction and cooperation. One creative solution I once saw was that the couple used the timeshare for a holiday vacation for the children. One year dad used the timeshare with the kids and another year mom used it with the kids. Q. Is it possible for a couple to share the same residence after a divorce? A. Frequently one of the parties will think this is a good idea and is surprised at my skepticism. The pitfalls are emotional, legal and, there can be tax consequences. Dividing up a house and living as roommates may have a certain simplistic appeal. Remember, these are people who cant live together as husband and wife. How will they share one roof? There will always be issues about the yard work, the dirty dishes and even the noise. It is confusing for the children as there are no clear boundaries as to moms time and dads time. What about dating? The same issues exist for co-ownership as described above but they are now exaggerated by the true joint tenancy. There are ownership and inheritance issues too complicated to go into here and there probably are some negative Federal Income Tax consequences. Residing in the same house requires some very carefully drawn agreements. Q. What about remodeling to add a mother-in-law unit for the other spouse? A. This solution may offer more privacy and alleviate some of the concerns of shared dwelling space, but it raises additional issues. First is to make sure that such a remodel is permitted in your community. It would be a real detriment to later find out you cant sell the property because it is not up to local code. Even if the locality allows such units, does it make economic sense? Will the property value increase in proportion to the cost of remodel? Does it make the home more or less desirable to sell? A conversation with a local real estate expert can answer these questions. If it does make economic sense, then the couple should consider the emotional and other legal issues of co-ownership. One couple reconsidered this option when I asked them who was going to mow the lawn? The shared residence may seem like a really logical solution but in reality, it is still full of pitfalls. So many pitfalls that even the most carefully crafted agreement won’t cover them all. Q. Do we really need a lawyer to handle these property issues? When it comes to real estate issues and divorce, you really should partner with a lawyer, or at least pay for a couple of legal coaching sessions. If you or someone you know is looking for professional and affordable legal services to help you through the dissolving a marriage without drama, Contact us for a Consultation. 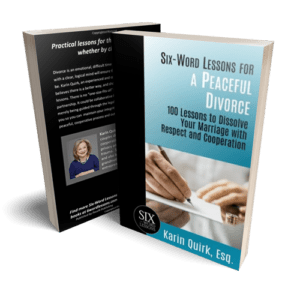 Learn more about divorce in Washington State with Six-Word Lessons for a Peaceful Divorce; 100 Lessons to Dissolve Your Marriage with Respect and Cooperation by Karin Quirk.